Fr. 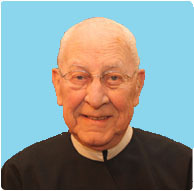 Gerard Schreiber died September 13 at the St. John Neumann Residence at Stella Maris in Timonium, MD. He was 83. A viewing will be held Sunday, September 16 from 5 to 7 p.m. in the main chapel at Stella Maris, 2300 Dulaney Valley Road in Timonium, MD. A funeral Mass will be celebrated Monnday, September 17 at 10 a.m. at Stella Maris. Burial will follow at Holy Redeemer Cemetery in Baltimore, MD. Fr. Schreiber was born November 8, 1928 in Baltimore, MD. He professed vows as a Redemptorist August 2, 1949, and was ordained to the priesthood on June 20, 1954. His first assignment was to the Redemptorists’ missions in Brazil where he spent almost 25 years working in Campo Grande, Mato Grosso, Ponta Grossa, Curitiba, Telemaco and Miranda. Much of that time he taught in and served as director of the Redemptorist seminary. He returned to the U.S. in 1980 and served in several parishes and ministries in Lancaster, PA; Brooklyn, the Bronx, and Esopus, NY; and in Hampton, VA. Prior to relocating to Timonium, Fr. Schreiber had been assigned to St. Clement’s Mission House in Ephrata, PA. Please pray for Fr. Schreiber, and for his family, friends, and Redemptorist confreres who mourn his loss.